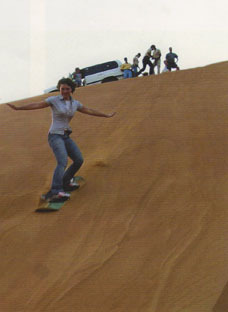 Should you choose to go on Desert Safari, your tour will depart in a 4x4 or hummer, travelling across the dunes in the early afternoon. There will be several photo opportunities at planned stops along the way to the first destination, a traditional camel farm. Your drive will continue crossing the desert where you will witness the beautiful sunset over the dunes, one of the highlights of the trip on an Arabian safari. Upon arrival at the campsite, you can choose to ride on a camel, experience the thrill of sand boarding, or try out a henna design on hands or feet before enjoying a delicious BBQ dinner and the fruity aromas of the famous shisha (Arabic water pipe). Then you can sit back, relax and experience the delights of the belly dancing performance by the campfire beneath the stars (year-round except Ramadan). A variety of sightseeing and cultural tours are available in either private cars, group convoy and on a double-decker bus. Sample the historic sites and vibrant cosmopolitan life, stopping at the famous landmarks of Dubai, including the Burj Al Arab - a must-see for all visitors. Take in the picturesque palaces and the iconic Grand Mosque of Jumeirah, as well as the renovated Al Bastakiya - the oldest place of Dubai. Finally, no city tour would be complete without a visit to the Dubai Museum in the ancient Al Fahidi Fort. Then it’s all-aboard on the Abra (water taxi) to cross the Creek and sample the delights and unique aromas of the Spice Souk with time set aside to shop at the most famous landmark of Dubai - the Gold Souk.